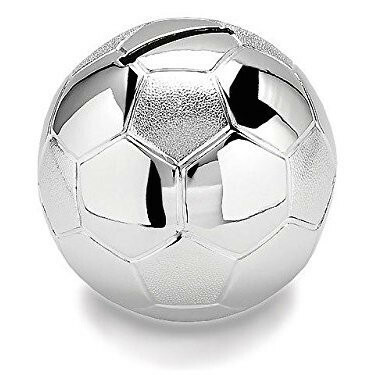 This silver plated football money box is in the shape of a soccer ball. Money can be inserted into the top and coins retrieved underneath. This money box is complete with it's own gift box with secure packaging. The perfect gift for a new baby or godchild / christening. What a wonderful keepsake! (Please note that this product is designed for a collectable gift. It is not a toy). Made in England UK by 'The Juliana Collection', guaranteed 100% excellent quality.